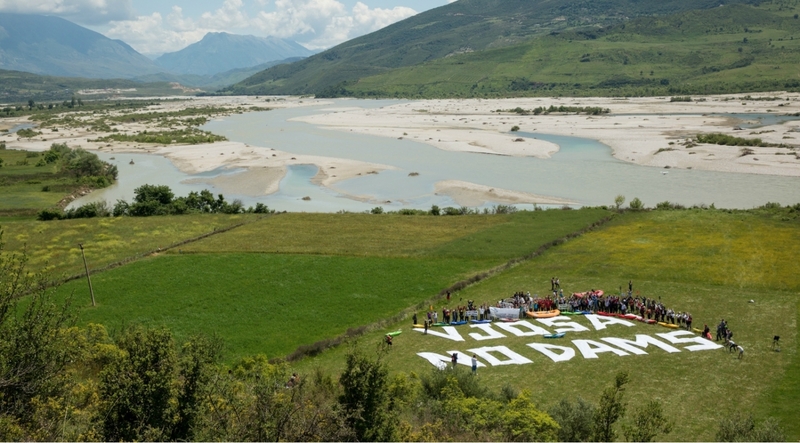 The rallying cry repeated as anti-dam protestors, activists, kayakers and local people from the Vjosa River valley marched through the Albanian capital of Tirana on Friday, May 20th. Translation: “No dams in Pocem!” This protest, the final event of the 35-day Balkan Rivers Tour, marked the delivery of a “kayak petition” to the Prime Minister of Albania, Edi Rama, and demanded an end to new dam development on the pristine Vjosa River, including a major dam project near the village of Pocem. The Vjosa, which flows 270 kilometers without barriers from the Pindus Mountains to the Adriatic Sea, is just one of many rivers in the Balkans region that is being threatened by a tidal wave of more than 2,700 new hydropower dam projects. Needless to say, it was my first anti-dam protest in Albania, and as I traveled with a team of Patagonia staff from our Europe and U.S. offices, it was inspiring to meet the local activists behind the event. For over a month, Rok Rozman, initiator of the Balkan Rivers Tour and former Slovenian Olympic rower, led a group of fellow paddlers on a voyage down 23 rivers, in 6 countries—nearly 390 kilometers total. Our aim? To bring greater awareness to the threats facing Balkan rivers, and to help others in Europe and around the world come to know the pristine and wild character of this place. As protesters gathered outside the offices of the Prime Minister, they were joined by local and international media representatives. While the heart of the protest was the energy of local people—mayors from all the towns in the Vjosa’s valley are against new dam development, and bus-loads of locals participated in the protest—there was also a strong international show of support. People from across Europe, the U.S. and the Balkans region raised their voices and their kayak paddles to chant with the locals. 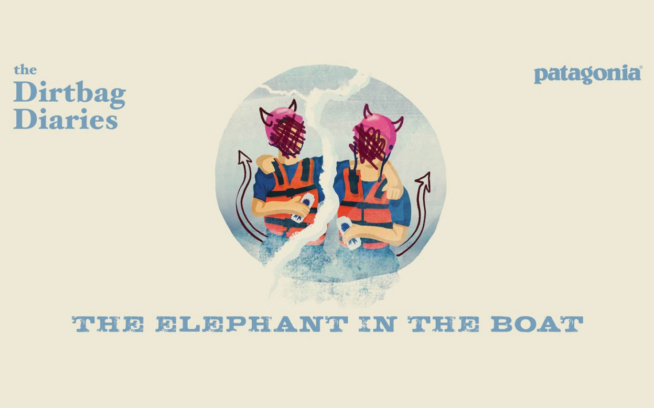 The strategy behind the Balkan Rivers Tour is international in nature, and it’s gathering momentum under the poetic campaign name: Save the Blue Heart of Europe. Our Patagonia Europe team has been supporting this campaign through grants and communication efforts over the past year. We’ve been inspired by the people, natural beauty and incredible recreation opportunities of this region. Joining the group at the end of the Balkan Rivers Tour were several climbers and Patagonia ambassadors who are exploring the region for alpine and free climbing opportunities and seeing great potential for sport and adventure. Joining us were Zoe Hart, Norbert Sandner, Marko Prezelj, Luka Krajnc, Nastja Davidova, Arnaud Petit, Stéphanie Bodet and Jon Bracey. This is a place where, unlike the rest of the continent, wild rivers still run free and local people are eager to see development and modernization that doesn’t flood and destroy their traditional lands. Eco-tourism and other forms of truly renewable energy represent the alternatives to dam development. As Ulrich Eichelmann, coordinator of the Save the Blue Heart of Europe campaign at Riverwatch, says of the Vjosa, “[This] is a world class river. At the very least, the Albanian government has to conduct an Environmental Impact Assessment according to EU standards. We demand that the Albanian government deploy a group of internationally renowned experts to carry out the required scientific studies.” Editor’s note: You can read Ulrich’s previous Cleanest Line post on the campaign here. It’s inspiring and encouraging to see this grassroots effort to stop new dam development in Europe. In the U.S., we’re struggling with a 100-year legacy of industrial dam building that has left us with over 80,000 dams across the nation. Many of these outdated dams are now crumbling, no longer serve their original purpose and are safety hazards, but all of them disrupt and damage the river ecosystems that they block. Here at Patagonia HQ in Ventura, California, we’ve been working for over 20 years to take out the Matilija Dam on the Ventura River. 20 years and counting, just to remove just one, old, decrepit dam. And for nearly 50 years prior to that, we can now see that the dam provided little value and caused major ecological damage. This is why stopping new dams, before they’re built, is so critical. Once you have concrete on the ground, and a dam in place, the inertia is immense. It takes decades to reverse course. Inevitably, over that time span, the river itself and the communities that depend on it experience irreparable harm. Dams are old technology. We can do better. Flood control, irrigation, municipal water supply, power production: all of these needs can now be met more effectively through conservation, improved technology and better planning, and without the negative ecological impacts caused by blocking and degrading an entire watershed. 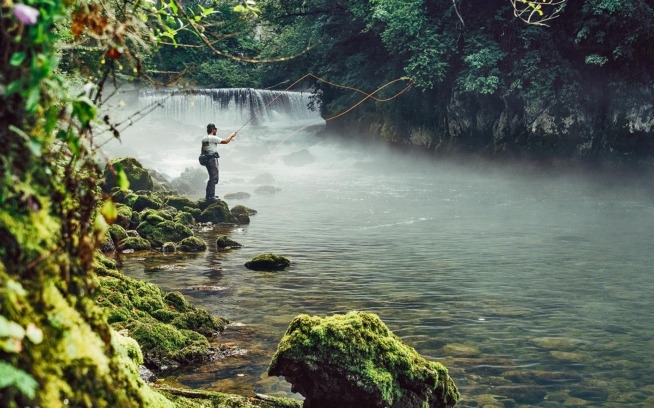 Save the Blue Heart of Europe and the Balkan Rivers Tour are, thus, visionary efforts—and among the most important conservation campaigns on the European continent right now. This work needs and deserves more attention. We applaud the leaders of this campaign, the European NGOs Riverwatch andEuroNatur. We were honored to meet and spend time with Uli Eichelmann, Gabriel Schwaderer, their entire teams, and with Rok and his group of fellow paddlers. 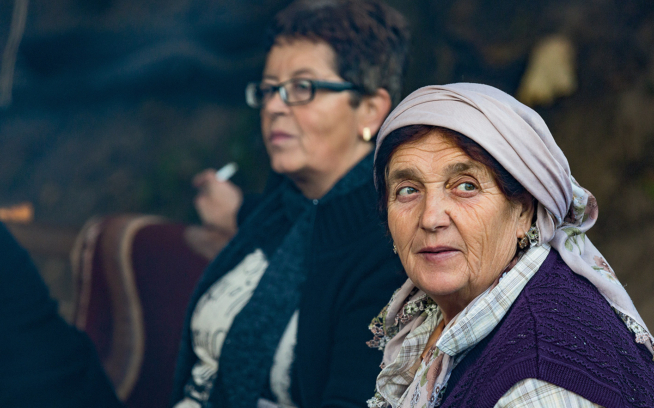 We join our voices with the passionate locals from Eco Albania andFriends of Vjosa, who stand to lose the most from dam development on their river. We honor your foresight, activism and willingness to learn from other communities’ and countries’ past mistakes, including our own. Jo diga ne Pocem! Save the blue heart of Europe!